The continuing medical education course titled "Vaccines - the safest protection against infectious diseases", organized by the Institute of Epidemiology, the Sector for Preventive Medicine, the Military Medical Academy was held at the MMA. The speakers were Head of the Institute of Epidemiology Colonel Assistant Professor Dr. Srdjan Lazic, Head of the Centre for Clinical Pharmacology prof. Dr. Victoria Dragojevic Simic, Head of the Department for the Prevention and Control of Nosocomial Infections prof. Dr. Vesna Suljagic and Dr. Milena Krstic and Major Zeljko Jadranin from the Institute of Epidemiology MMA. 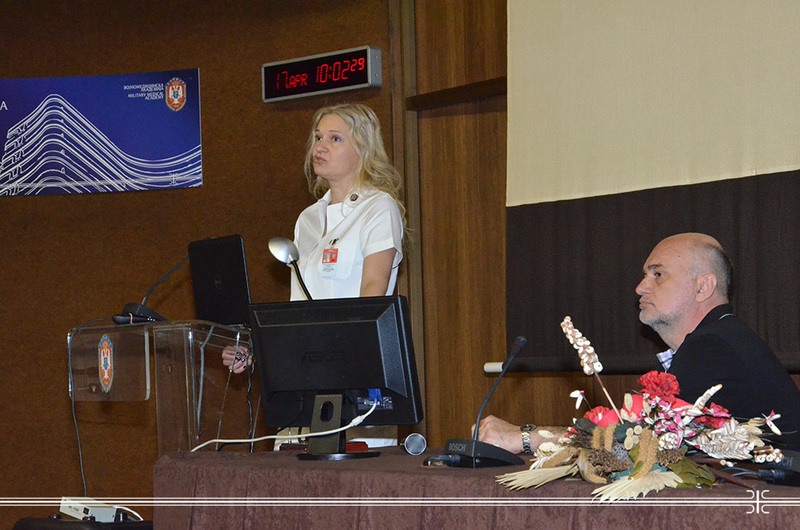 In her opening remarks, the Head of the Sector for Preventive Medicine prof. Dr. Sonja Radakovic said that currently the most important public health issue in Serbia is a question about vaccination. She stressed the importance of mandatory vaccination and to illustrate that she stated that life expectancy in the last 150 years has been more than doubled, largely due to vaccination, which significantly reduced the infant mortality. The Military Medical Academy is engaged in the vaccination of the military insured children at the Children's Out-patient Center of the MMA, also in the vaccination of risk groups and patients such as health care workers, as well as vaccination of members of the Serbian Armed Forces and the Ministry of Defence participating in peacekeeping missions. The course also addressed the basic principles and vaccination strategies and the safe application of vaccines. The importance of vaccination of pediatric population for the prevention of the occurrence of infectious diseases and preventing possible complications was pointed out. Also, lectures covered the use of the vaccine in the prevention of infections in the hospital setting, and it was discussed about the vaccines development ways and vaccination of passengers in international traffic. Especially the importance of vaccination as a preventive measure in the context of the preparation of the Serbian Armed Forces for peacekeeping missions was emphasized. Given the fact that the members of peacekeeping missions are exposed to a large number of infectious diseases in the countries they are deployed in, the adequate professional preparation in terms of education about the risks of infection and implementation of general and specific preventive measures is necessary. The vaccination as a specific measure for the prevention and curbing of infectious diseases, in addition to providing hygienic water for drinking and use of antibiotics, is the most effective tool in the fight against these diseases. The benefits of vaccination reach not only individual members of the population, but this preventive measure is of great importance for the population as a whole. The spread of infection in the population, from person to person, is prevented only if a large percentage of the members of that population are immune (high collective immunity). In this way the benefit of the immunization refers to the population as a whole. It is possible to eliminate or even to eradicate certain infectious diseases with appropriate vaccines and the vaccination strategy.